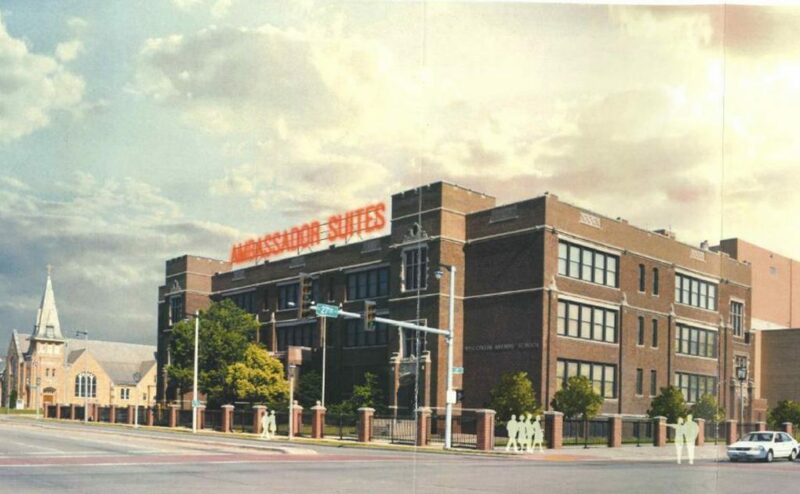 Developer Rick Wiegand is moving forward with his big plans to transform the former Wisconsin Avenue School at 2708 W. Wisconsin Ave. into an extended-stay, luxury-suites hotel called Ambassador Suites. The new hotel will be combined with the adjacent City Campus office buildings to dramatically reshape the intersection of N. 27th St. and W. Wisconsin Ave.
Wiegand went before the City Plan Commission Monday afternoon to secure approval to rezone the site to allow for the hotel and other office uses. The commission unanimously endorsed the change. The developer acquired the school for $200,000 in December 2017. He was the only respondent to a July request for proposals to acquire the 92,600-square-foot building. Originally built in 1918, the building will be converted into 23 large hotel suites by Wiegand, with virtually every classroom becoming a suite complete with kitchen. The former coat room in each classroom will become the bathroom. The common amenities will be in the lower levels of the building. The dining space will open onto a terrace to the north facing the City Campus buildings. This will also allow guests access to a small parking lot on the property, and give them access to a shared parking lot across N. 28th St. That parking lot, part of the City Campus property, will soon be better connected to the two properties as the city has already approved vacating N. 28th St. from W. Wisconsin Ave. to W. Wells St. to unify the parcels. Wiegand will use his existing hotel operation to operate the Ambassador Suites. The developer owns and operates the nearby Ambassador Hotel at 2308 W. Wisconsin Ave., which includes the Ambassador Inn auxiliary building just across W. Wisconsin Ave.
"This operation really doesn’t make financial sense except that we’re able to use the same management team from the hotel and inn to run this,” Wiegand told the City Plan Commission. The developer told the commission he hopes to begin overhauling the school as early as this summer. "We’re already starting site work to clean up the appearance of the playground and the fencing, just to make it look better,” said Wiegand. Rick Wiegand’s interest in the project is clearly not just to expand his successful hotel operation. In 2015 the developer purchased the former Milwaukee County City Campus immediately north of the former school for $272,000. Wiegand previously told a Common Council committee: "As I’ve tried to develop City Campus, parties that I have had in there have asked about the future of the school.” He now has an answer for that question, and intends to use the suites as an amenity for potential tenants including the meeting rooms and dining space. Since he introduced the school plans in September 2017, Wiegand has landed a key tenant for the 160,000-square-foot, three-building City Campus. Food and Beverage Wisconsin (FaB Wisconsin) will develop The Future Food Center in the building. FaB’s project website states that the project goal is to create "a place where food and beverage businesses co-locate for a competitive advantage and a shared vision for better food and drink.” The organization already has commitments for 25,000 square feet of space in the building, and says it will move forward when it has secured tenant commitment to rent at least 50,000 square feet of space. A rendering for the project depicts the conversion of the nine-story building at the center of City Campus, a former hospital, into a facility with a research and development lab, office space, public gallery, classrooms and rooftop farm. Quorum Architects is leading the project design. Wiegand is also involved in the Near West Side Partners effort to redevelop the southwest corner of N. 27th St. and W. Wisconsin Ave. The non-profit, through an affiliate, has acquired the entire block and is seeking to attract a state office building. Governor Scott Walker says the state hopes to make an announcement on that effort on May 28th. Proposals were due March 9th.